What’s the one thing you’d change about your local area? What would you like to see more money spent on in your community? Please tell us your answers to these and other questions by taking part in our Community Survey – you’ll also be helping to plan for the future of our area. The survey is being run by Newsome Community First, who are a group of local people working together to support and encourage community projects. We have almost £40,000 of funding available over the next two years, and the survey results will help us decide which projects to support. We are keen to get the views of as many local people as possible – from all the different neighbourhoods right across the Newsome Ward. the survey is open until Monday 25th February 2013. Share the link with your friends and neighbours in the Newsome Ward. Are you part of a local group? Can you hand some paper copies of the survey out to your members? Are you involved with a community venue? Can you hand some surveys around in your venue? Do you live in Ashenhurst, Springwood or Primrose Hill? Can you hand some surveys out to your neighbours? (We already have a team of timebanking members and local volunteers knocking on doors all over the area, but we could do with a few more helpers in some places). To request paper copies of the survey, please email Diane at: Newsomeward.Huddersfield@gmail.com or call 07941 652836. Armitage Bridge, Ashenhurst, Aspley, Berry Brow, Bluebell Hill, Broadgate, Folly Hall, Hall Bower, Highfields, Lockwood, Longley, Longroyd Bridge, Lowerhouses, Newsome, Primrose Hill, Rashcliffe, Salford, Springwood, Stile Common, Taylor Hill and Huddersfield Town Centre. We’re having some community Christmas activity sessions on Wednesday 21st November and Wednesday 28th November. Come along to get some seasonal tips, share ideas and make a few useful things for the festive season. At the first session, you will be able to have a go at making different festive items – an edible gift, a toy or a pampering gift. There will also be helpful advice on hand on how to make your money go further this Christmas, as we can appreciate it can get very stressful at this time of year. For the first session, you can attend either in the morning or the afternoon, as the activities will be the same. The following week, we hope to put on the activities chosen by you, and this session will take place in the morning only. You are welcome to bring pre-school children, but they must be supervised at all times. Organised by Newsome Ward Timebanking, Newsome LEP, Hillside Primary School and Kirklees Council. A chance to meet new people and learn new skills! clothes – repair and recycle! St. John’s Church Hall is the building with the curved blue roof, just near the junction of St. John’s Avenue. or send us a message using our contact page. We asked people what they thought about Timebanking in Newsome, this is what they said. “I’ve seen more people joining in community activities. I’ve seen new friendships develop. I’ve seen people experiencing difficulties, being helped by volunteers. It has helped us develop a successful food growing project which has captured the attention and imagination of people across the authority. It has inspired people to take more of an active role in their neighbourhoods.” I’d like to see more of the same. It takes time to build confidence in people to take part in any initiative, but people now believe in this, it has a positive track record, and it needs to continue. I’d like to see more people getting involved and helping each other out. Julie Stewart-Turner Chair of Newsome Community Forum. “I think Timebanking is… very valuable …. as it works in communities and with individuals to help build or rebuild their lives.” Pam Kent of the Local Ecumenical Partnership. “I’ve seen more people joining in. I’ve seen people experiencing difficulties, being helped by volunteers. It has helped us create more activities within sheltered. (Housing )” Mel, the manager of a local sheltered housing project. We’re delighted to say that one of the many local projects that our members participate in has won an award. Growing Newsome won the Community Award at the first ever Kirklees Mayor’s Local Food Awards in March 2010. Newsome Ward Timebanking members attended the awards ceremony at Huddersfield Town Hall and talked about what being part of the Newsome community means. 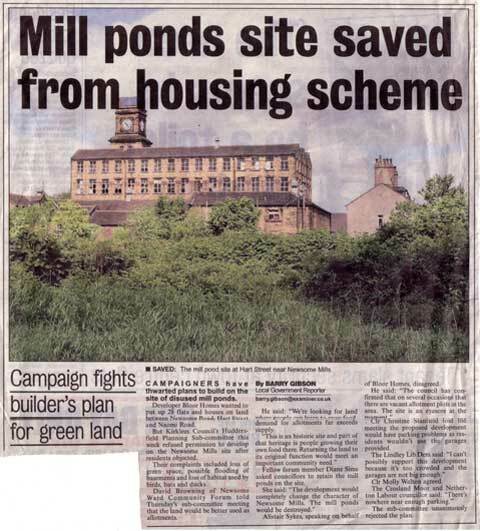 Newsome Ward Timebanking has helped the Newsome community to protect its Grade II listed mill (threatened by theft, vandalism, arson and neglect) by sharing information, engaging people in the planning process and bringing people together. Timebankers ran a door-to-door survey as part of the ongoing campaign to retain Newsome Mill Ponds and the former mill-workers’ allotments. The resulting research report demonstrated the huge demand for local allotments, helping to win an eleventh hour planning appeal. This work also gave rise to the Growing Newsome project, through which timebankers are supporting each other and the wider community in growing their own local food.